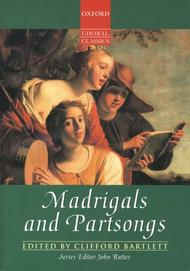 Madrigals and Partsongs composed by Clifford Bartlett. Arranged by John Rutter. For SATB choir, mainly a cappella. Mixed Voices. Oxford Choral Classics Collections. Secular, Choral Collection. Vocal score. 384 pages. Published by Oxford University Press (OU.9780193436947).ISBN 9780193436947. Secular, Choral Collection. 11 x 7 inches.This book contains 59 of the finest examples of the secular choral repertoire, ranging from the late 15th to the 20th century and spanning all the major European countries. All the pre-twentieth-century pieces are in completely new editions going back to the earliest and most reliable sources. Includes English translations and playable keyboard reductions. Some items from this volume are available separately in the Oxford Choral Classics Octavo series.